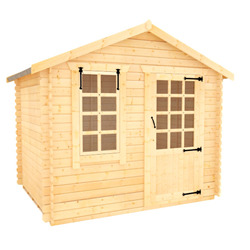 Find out more about our Single Door Log Cabins range. Selecting the finest timber we handcraft all of our cabins in Yorkshire and with years of experience we are proud of the extensive range we offer. Balancing the design to fit a single door we have laboured to ensure that each building offers comfort and adaptability. Offering a number of different sizes and the choice to have a bespoke building which will be slotted into your garden, it will soon relax into its surroundings becoming a treasured spot.